Posh full-back Michael Smith is believed to have been called up to play for Northern Ireland. Peterborough United have postponed their League One fixture at Fleetwood on Easter Monday (March 28) because of international call-ups to three players. 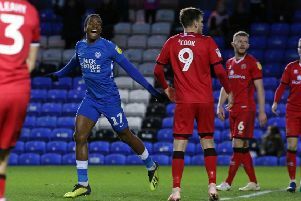 Posh are unable to name the three players concerned because the relevant international FAs have not publicly revealed their squads, but the Peterborough Telegraph believes full-back Michael Smith and central defender Gaby Zakuani are two of the players concerned. Smith has been watched extensively by Northern Ireland manager Michael O’Neill and his representatives and Ireland have friendly internationals scheduled againt Wales in Cardiff on March 24 and Slovenia in Belfast on March 28. If Smith performs well he will have a chance of forcing his way into Ireland’s squad for the 2016 Euros. Smith (27) is uncapped at senior level, but has won under 23 caps for Northern Ireland. His chances of appearing at the Euros have increased as Chris Brunt has been ruled out of the summer tournament because of injury. Brunt has been playing left-back for Northern Ireland, a position Smith has played in for Posh recently. Posh have re-arranged the Fleetwood game for Tuesday, April 5 and aplogised for the inconvenience for all the Posh fans who had already booked hotels and tickets for the original date. It’s known that numerous Posh fans have made arrangements to stay in nearby Blackpool over the Easter weekend. Posh chairman Darragh MacAnthony has offered free coach travel to the re-arranged game for all those fans who had pre-booked travel on the original date. Posh have not called off their League One home match with Coventry on Good Friday (March 25). That game is due to be televised live by Sky Sports. Dr Congo have African Cup of Nations qualifying matches against Angola scheduled for March 26 and March 29. South Africa Under 23s have a prestige friendly against Brazil on March 27 which could involve Posh defender Kgosi Ntlhe. The senior Republic of Ireland team has friendlies against Switzerland on March 25 and Slovakia on March 29, but it’s not thought that Posh midfielder Chris Forrester will be involved. Former Posh striker Conor Washington is also expected to be named in the Northern Ireland squad. Posh will receive an extra payment on top of the £2.5 million QPR paid for Washington in January if he plays for his country.